Experts have long claimed Britain’s prehistoric monument Stonehenge may have been a Druid temple, a huge calendar or a healing center. But new research suggests the ancient site functioned as a raised altar where crowds of worshipers gathered. The giant stone structures would have functioned as a support for an expansive wooden platform on which sacred ceremonies were carried out, the theory goes. In an interview with The Guardian, Julian Spalding, previously director of some of Britain’s most prominent museums, said the megaliths formed the foundations of “a great altar” elevated from ground level. He suggested they were capable of supporting hundreds of pre-Christian worshipers. Spalding said ancient worshipers would have climbed spiral wooden ramps or steps to reach the platform. He went on to argue previous interpretations of the prehistoric monument could be false. “We’ve been looking at Stonehenge the wrong way: from the Earth, which is very much a 20th-century viewpoint,” he said. Geoffrey of Monmouth, a Welsh cleric with a penchant for histiography and the tales of King Arthur, wrote in the 12th century that the wizard Merlin had taken it upon himself to fly the stones used to build the monument from Ireland. From Monmouth’s era onward, Stonehenge has been associated with a range of theories ranging from plausible to downright obscure. More recently, the prehistoric site was described as an ancient “Lourdes” where people ferried ill friends and loved ones to be healed by the magic stone structures. Others suggested it was a haunted haven for the deceased or perhaps a mecca for seasonal feasting. The prehistoric monument was constructed at some point between 3,000 and 2,000 BC. 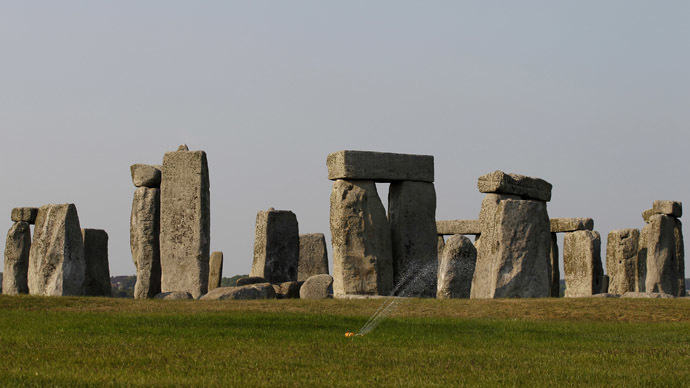 Located in Wiltshire, England, it attracts over 1 million visitors each year. The outline of missing stones, which became visible during a drought in 2014, indicate it once formed a perfect circle. Spalding says Stonehenge theorists have previously been misguided. The evidence for his theory, he suggests, stems from multiple archaic civilizations across the globe. In far-flung places such as Peru, China and Turkey, sacred structures were elevated, sometimes on manmade and sometimes on natural sites. These monuments often took the form of circular patterns linked to celestial ceremonies, experts suggest. “In early times, no spiritual ceremonies would have been performed on the ground. The Pharaoh of Egypt and the Emperor of China were always carried – as the Pope used to be,” Spalding told The Guardian. “That would have been unimaginably insulting to the immortal beings, for it would have brought them down from heaven to bite the dust and tread in the dung,” he added. His theory, however, has not been endorsed by all Stonehenge experts. Prof Vincent Gaffney, a leading investigator on Britain’s Stonehenge Hidden Landscapes Project at Bradford University, told the Guardian he was skeptical of Spalding’s suggestions. But Archaeologist Aubrey Burl, an expert on prehistoric stone structures, said he is keeping an open mind. He told the paper that Spalding’s theory was plausible.